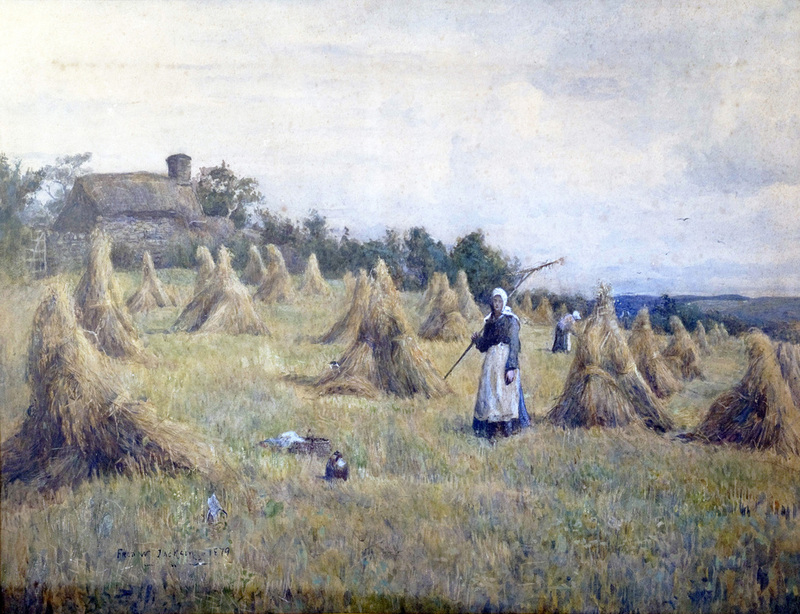 Harvest Time is a watercolour, 20.5 x 29 in (52.1 x 73.7 cm), painted by Fredrick William Jackson RBA in 1879. Watercolour sketches were an important part of Jackson’s production. This gentle and sentimental painting was probably painted ‘plein-air’ (outside), as it feels atmospheric with a great sense of breadth and light. Jackson loved to paint outside in nature, often to the detriment of his health. Using a spontaneous, loosely handled technique, with fine tonal gradations, a painterly effect has been created. The subject matter depicts the world of peasants and rural labour. Here, we see a traditional scene of two women raking the corn after it has been reaped (cut). Swathes of cut grain stalks are gathered into bunches, sheaves (singular sheaf), and tied with string or a twist of straw. Several sheaves are then leant against each other with the ears off the ground to ripen and dry out, forming a stook. This hard physical labour could take several days for each field of corn. The central figure stands looking at the artist with her wooden rake in hand, her basket with bread for food and a stoneware jug of water are set amongst the corn. Manchester School - Jackson had relatively little formal training, however, his interest in painting was evident from an early age. As a boy he went on sketching tours with his friend, the future architect, Edgar Wood. After leaving school he attended evening classes at Oldham School of Art, where he studied painting under John Houghton Hague (1842-1934). Hague's brother, Joshua Anderson Hague (1850–1916), was the leader of a group of young artists known as the 'Manchester School'. This group was making a considerable impact in the mid-1870s and Jackson was drawn towards them. Nearly all these artists had been trained at Manchester Academy of Fine Art and they met together in Wales in the early 1870s at the studio of the self- taught Joseph Knight (1837–1909). They were influenced by the Barbizon School of painters, mid-19th century painters who worked in and around the village of Barbizon on the outskirts of the forest of Fontainebleau, southeast of Paris, and also by Dutch painters, Anthonij (Anton) Rudolf Mauve (1838-1888) and Jozef Israëls (1824-1911), at a time when, in Britain, Dutch paintings were in demand. Arts Club - In 1879 Jackson was made a member of the Arts Club (1863-1896), founded and based in Dover Street, Mayfair, London by, amongst others, English writer and social critic, Charles Dickens (1812-1870), English novelist, Anthony Trollope (1815-1882) and English painter and sculptor, Lord Fredrick Leighton PRA (1830-1896). Although a social venue it was known to be a place where influence could be exerted and careers developed. It was seen as the powerhouse behind the dealings of the Royal Academy. North Wales - During 1880-81 Jackson was made a member of the Limners Club. That same year he went to live in Plas Mawr, Conway, North Wales, where a considerable number of Manchester artists were already living. These included artists, Henry Clarence Whaite, known as Clarence Whaite (1828–1912), Joshua Anderson Hague and Edward Norbury, who were planning to found the Royal Cambrian Academy (founded 1881). France - Despite a strong native tradition of landscape painting in Britain, 19th century French landscape painters attracted the young artists of Jackson's day. So it was inevitable that Jackson, as a young artist, should be drawn to France, which had superseded Italy as Europe's artistic centre. (Cross, 1978) In 1885 Jackson went to Paris and enrolled as a student at the Académie Julian where, although their students took exams at the École des Beaux-Arts, they also offered independent teaching. (Hoyle, 2014) Jackson studied under Jules Joseph Lefebvre (1836-1911), a French figure painter, educator and theorist, many of whose paintings are single figures of beautiful women, and Gustave Boulanger (1824-1888), whose paintings are prime examples of academic art of the time, particularly history painting. (Wood, 1978) During that time it seems that Jackson was not influenced by his teachers, as they worked in a meticulous and academic style favoured by conservative French art lovers of the day, which was totally alien to Jackson’s own approach. New English Art Club - Also studying at the École des Beaux-Arts during the same period under J L Gerome (1824-1904), French painter and sculptor, was Oldham-born William Stott (1857–1900) and Henry Herbert La Thangue (1859–1929). (Jackson, 2014) La Thangue became associated with the Newlyn School and was a leading figure in founding the New English Art Club, set up in opposition to the training given at the École des Beaux-Arts. He also studied at the Royal Academy and in 1887 described the Academy as, 'the diseased root from which other evils grow'. (Chilver, 2009) Jackson also became a founder member of the New English Art Club in 1886. Royal Society of British Artists - Jackson became a member in 1894. Artist Colonies - At the turn of the century many artists' colonies were springing up throughout Britain and the world. Artists wanted to escape modernity and the acceleration of industrialisation and urban development, which many found repugnant. They were concerned for the loss of traditional ways of life, due to urbanisation, and felt that only in the fishing communities could there still be found a group of people involved in an unchanged, constant struggle with the elements. 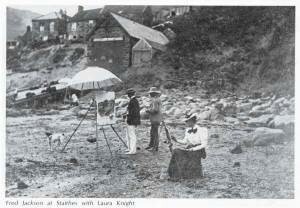 Artists’ colonies also offered cheap accommodation, a ready supply of models and a range of picturesque subjects. There was a shared interest in, and concern for, working people, especially agricultural labourers and fisherfolk. Artists returned to nature in real communities with people they thought were unsullied by civilisation. Ironically, the towns and cities they criticised for their dirt and ugliness were those upon which they were largely dependent to sell their paintings in the increasingly sophisticated art world which had developed there. Staithes and Runswick Bay Group - Leeds painter, William Gilbert Foster (1855-1906), first pioneered painting at the North Yorkshire fishing villages of Staithes and Runswick Bay. Jackson was a regular visitor and he eventually, in 1884, settled down in the area and continued well after most of the group – having been taught by him – had left. (Hoyle, 2014) Foster and Jackson worked mainly in Runswick Bay but kept close links with their home cities, Leeds and Manchester respectively. 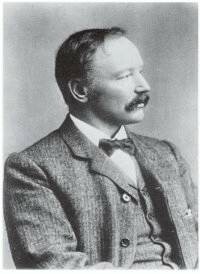 He became a founder member of the group in 1901, the same year as he was Vice-President of the Yorkshire Union of Artists. (Hoyle, 2014) He lived at Ivy Cottage, Hinderwell, near Whitby, where he married Carrie Hodgeson, the daughter of a Yorkshire farmer. 'It is well to remember that the language of paint, like many others, is kneaded and shaped by all the competent workmen labouring at a given moment, that it is, with all its individual variations a common language, and not one of us, would have been exactly what he is but for the influence and the experience of all the other competent workmen of that period'. making them more acceptable to public taste. They exploited the new technique but preferred to keep solid draughtsmanship and a sense of form. More than anything else they served to popularise one very important aspect of the Impressionist method, 'plein air' painting i.e. painting out of doors. Jackson doggedly pursued these principles of 'plein air' painting throughout his life and encouraged the younger artists of the Staithes Group to follow his example. Staithes did not have anything like the Mediterranean climate of the other English 'plein air' colony at Newlyn in Cornwall. It was exposed to the harsh winds of the North Sea and working out of doors must have often involved considerable discomfort. Knight commented on his perseverance in battling with these conditions, 'he painted out of doors in any weather. Under the mittens he wore, his hands were swollen, stiff and chapped, as were the edges of his ears and the wings of his nostrils'. Portrait Painting - Jackson was also an accomplished portrait painter and received many commissions for portraits of local dignitaries and worthies. Except for the portrait of A G C Harvey, President of the Liberal Association, in which the artist seems to have attempted to introduce a note of informality, these 'municipal' works are undistinguished and typical of this genre despite their skilful execution. Jackson’s work appears in almost every public collection in the North of England. It is displayed at Bradford, Huddersfield, Leeds, Manchester City, Oldham, Rochdale and Whitby art galleries. New English Art Club (NEAC): Manchester City Art Gallery in 1908 and the Dowdeswell Gallery, London, in 1911. However, he did not exhibit at Sickert and Steer’s separate exhibition of 1898 entitled 'The London Impressionists'.